You can “Bee Sweet to the Earth” during a free Earth Day event, Saturday, April 22nd, 2017 at 21 Acres in Woodinville. Celebrating the milestone of five years as an education center, 21 Acres is showing gratitude to the community with activities about bees, pollination and the connection to the local food and agriculture system. According to Operations Director, Kurt Sahl, “Visitors can expect family friendly education and learning opportunities about growing, eating and living sustainably.” Sahl says visitors will be able to learn about worm condos, how to plant a pollinator garden, fungi, butterflies, and more. 21 Acres is located at 13701 NE 171st St., Woodinville. The free event begins at 10 a.m. and runs through 4 p.m. With food, games, demonstrations, music and kid activities, all ages are welcome. There will be cooking demos, tastings and samplings from the 21 Acres Kitchen, plus artisan vendors selling food onsite. 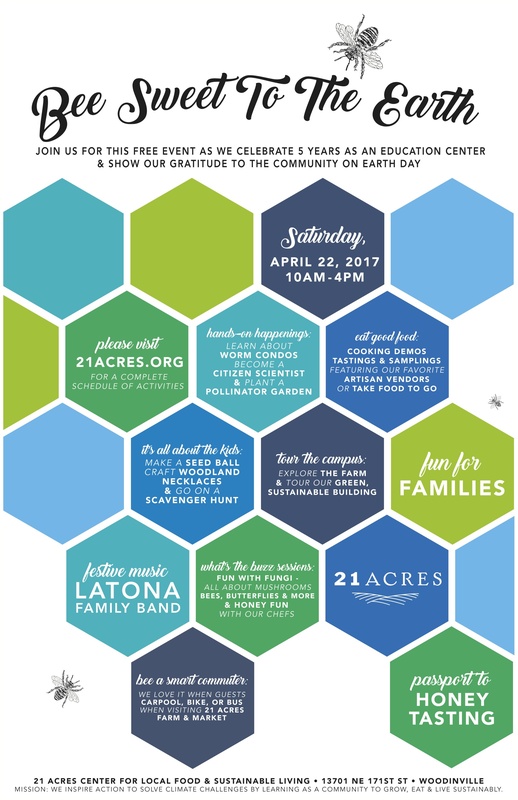 The Latona Family Band will provide live music. Attendees will also be able to tour 21 Acres’ sustainable building and campus. In addition, kids will have the opportunity to make a seed ball, craft woodland necklaces and go on a scavenger hunt. Join in the Waggle Dance, have a fun-filled day of family activities and bee happy! For more information visit 21Acres.org.